Although it doesn’t quite pack the same gut-punch power of the first movie, Sicario: Day of the Soldado still succeeds as a riveting and relevant action fable set within the very real world of cartels, terrorists, and the government agencies set to combat them at any cost. The cinematic world of Taylor Sheridan is one where the lines between good and evil, right and wrong, are muddled with deceit, dirt and blood. Sicario, the critically acclaimed 2015 thriller that introduced Sheridan as one of the best screenwriters today, featured the perfect environment for Sheridan’s world to fester: The War on Drugs, especially against the Mexican Cartels. Directed by Denis Villeneuve, Sicario was tense, riveting and all around terrific. 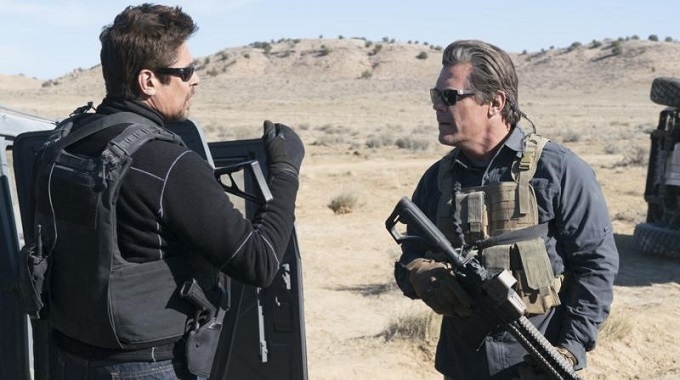 Three years later arrives its sequel Sicario: Day of the Soldado, with Italian filmmaker Stefano Sollima (Suburra) taking over directing duties. While Villeneuve’s absence brings with it a reduction in that simmering, nerve racking tension that made Sicario such an engrossing watch, Sollima regardless does a great job in bringing Sheridan’s violent, unrelenting world to life. The film beings in typically grim style, as four suicide bombers detonate themselves in a busy Kansas City grocery store. When it is revealed that the Mexican Cartels are trafficking terrorists into the United States, the US government gives permission to black ops CIA Agent Matt Graver (Josh Brolin) to escalate the fight against the cartels. This involves recruiting lethal black ops assassin Alejandro (Benicio Del Toro) in a mission to start a war between the major cartels, a war that crumbles under the weight of corruption and gutter politics. While key players such as Villeneuve, cinematographer Roger Deakins, and late, great composer Johann Johannsson are not involved in this sequel, Sicario: Day of the Soldado still succeeds in keeping the tone and look of the first film in check. Cinematographer Daruisz Wolski (Prometheus) does an excellent job in providing that sunburnt visage that captures a literal Hell on Earth, while composer Hilder Guonadottir (Mary Magdalene) continues to make his mark with a brooding, pulsating score. Both Brolin and Del Toro reprise their characters with strong turns. Yet a chemistry imbalance is felt with the absence of Emily Blunt, who in the first film played the moral conscience within a bleak world where the lines between black and white constantly blur. 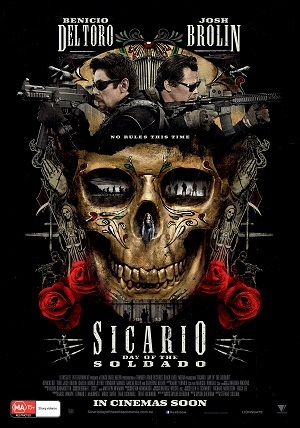 Sub-plots featuring burgeoning teen actress Isabella Moner as the daughter of a cartel boss, and relative newcomer Ellijah Rodriguez as a Mexican-American teenager recruited to traffic immigrants for the cartels, don’t bring with them the same emotional wallop that made the first Sicario a film of high stakes. This brings us back to Sheridan. While his screenplays are usually tight in structure and powerful in its storytelling, Sicario: Day of the Soldado finds the Oscar nominee floundering, with the need to expand what should have been a one-off film in Sicario, resulting in a good, yet weaker follow up. Fortunately for us, Sheridan at his B-game is still a step above everyone else. Here’s hoping the inevitable third film in the Sicario franchise can tighten things up again.